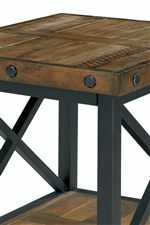 Featuring farmhouse style sliding doors, this TV console exudes rustic industrial style. Exposed bolts and reclaimed wood construction create a look that's warm and full of character. Cord access holes, drawers, and adjustable shelves give you everything you need for your modern entertainment setup. 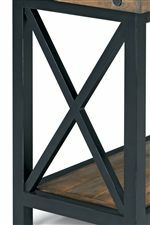 The Carpenter Entertainment Stand with Sliding Farmhouse Doors by Flexsteel at Conlin's Furniture in the Montana, North Dakota, South Dakota, Minnesota, and Wyoming area. Product availability may vary. Contact us for the most current availability on this product.